Villa Amethestos is a beautiful well maintained villa. Set on a hill side with breath taking views overlooking the Coral Bay and Pegia village. The main features of this fantastic property are, 1 double bedroom en-suite , 1 twin with 2 4ft beds, 1 Triple room with double and single bed, and a single bed in the lounge which can be curtained off. 2 bathrooms including 1 master bed en-suite. Cloakroom next to Lounge. Large living space including English & Nile Sat. TV and WIFI. The villa is 12 years old and has a welcoming appeal being built to a very high standard including all fixtures and fittings. The villa has beautiful well stocked gardens with fruit trees and shrubs. There is a private pool (8x4m) with sun loungers and parasols and pool side pergola. Breathtaking views from all around this villa and pool area. Close by are restaurants, supermarkets, cafes and lovely places to visit. Newly built outside Barbeque with rotisserie and sink with running water. My name is Sue Coleman. 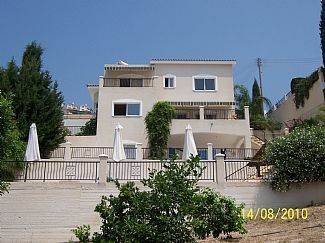 we have a family villa in Peyia, Cyprus, which we had built about 6 years ago. This is Villa Amethystos, a name we took from a Greek bottle of wine that we drank in Chepstow. The name reminded us of the lovely ambience of Cyprus, and the villa we love. We are proud to say we have such a lovely position, overlooking the sea, and feel we would like to share the experience with like minded friends and people who will appreciate our beautiful home. I am an interior designer, with a passion for colour and texture, which I think our villa reflects. Paul my husband, has an architectural practise, so between us we have created a beautiful home which we hope you will enjoy and appreciate. We are both happy to help with any arrangements for travel and car hire. Enjoy! We bought our villa because of the location. we have the most wonderful view towards the sea and the situation is quiet and peaceful. Peyia is a short drive for supermarket shopping, an ideal location for easy access to all sorts of places. The villa is 35 minutes from the new Paphos Airport, which means you can have a last swim about an hour befor check-in! On the other hand, a trip to Latchi on the other side of the island is again about 35 minutes away. The beach at Coral Bay is 5 minutes away. and there are some amazing tavernas and places of interest close by. We love the fact that we can have peace and quiet or as much action as we want within 10 kilometers. What with the beautiful weather most of the year round its an ideal place to escape to. The benefits of our villa are its spaciousness, its lovely internal fittings, and very comfortable lounge and bedrooms. We have air conditioning in all the main rooms, which can be turned to heat for the cooler season. The pool has a new liner so is looking really clean and enticing. We have ample sunlounging chairs and pretty gardens around the Villa. Its very easy to shop for fresh bread in the morning from the bakers in Peyia, which is a real find. The resident neighbours are every welcoming and happy to assist if a problem occurs. We also an English cleaner who is reliable and trustworthy and more like a family friend, who is also on hand for extra cleaning. The garden is looked after by our own gardner, the orchard is now bearing fruit such as mandarins, grapefruit and lemons. The family bathroom has a bath with shower fitting over, includes W/C and wash basin. There is a mirror shelf unitsto store toiletries etc. shower curtain, towel rail, lockable doors. Similar en-suite bathroom has a separate shower cubicle and a bath. Large lLiving room with large comfortable sofa's, coffee tables, single seat chairs, curtains with both windows and large sliding patio doors to balcony. Full satellite TV with DVD player / Radio - CD Player. WIFI Internet available. Air con. Skiing is available in the Troodos mountains during the winter period, about 1 hour's drive. Paphos has a new Driving range. Golf courses are at Tala, near Paphos. Also The Secret Valley Course is a beautiful course near Paphos airport. Notes on accommodation: 3 tall Portable Room fans available. The Cloakroom is useful for extra guests. There is ample living space, and the kitchen is fully fitted. Inside Dining table seating 6 - 8 people. Two put you up beds are available for extra guests. A store room and shaded relaxing area is on the level below, with views to the sea. Outside: The Villa has 6 sunloungers with pvc foam cushions, an outside eating area on 2 levels with tables and chairs on both. A Cypriot barbeque is available. A covered pergola provides shade for at least 3 loungers by the pool. Parasols and pool side tables are available. The orchard is bearing fruit which is free to pick when in season. The pool is 8x4m. The pool is maintained twice weekly in the high season, and had a new pool liner in 2010. The pool is private and secluded in part. Cleaning / Towels / Linen / Maid service: Towels are provided for bathrooms, not swimming towels. A cleaning service can be arranged by negotiation. Other: A Cloakroom with washhand basin and toilet is on the main living area floor. We had a lovely time staying in early July.The villa was lovely; spacious, well equipped and maintained. Fantastic views from the terraces. The provisions left for us - milk, butter, sparkling wine were very welcome. The water cooler came in very handy in the hot weather. The villa is on the edge of the village and it was very peaceful. We would recommend the Old Cinema Restaurant in Peyia very enjoyable food and value for money. The distance to the nearest beach at Coral Bay is about 3 kilometers. This is a busy local beach, used by the locals and tourists from the surrounding area. Paphos airport is the nearest to the villa. Although Larnaca is an option about 2 hours drive. Car hire isa available at the airports or can be arranged through our own personal car hire supplier. Paphos is about 15 km, about 20 minutes by car. Peyia is 2 minutes by car, Coral Bay is 3 km and 5 minutes away. We can provide a meet and greet service at a designated location by our friends who live in Peyia. You will then be escorted to the villa to ensure you arrive easily. You will also be shown round the Villa to know where everything is and how it all works. A welcome pack is also provided on your arrival. Booking Notes: Please contact owner for details.